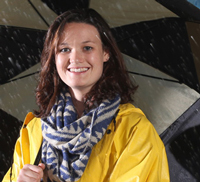 Many graduates pursue careers with the National Weather Service, the National Environmental Satellite Data and Information Service, the Environmental Research Laboratories, and the Department of Defense. Graduates also pursue careers with private meteorological or environmental consulting firms that provide weather information and apply atmospheric sciences to air pollution control, energy distribution, marketing, transportation, weather modification, and agriculture. Graduates also work for insurance and commodities industries that employ meteorologists who are educated in statistics, agriculture, and world climates. Applied meteorologists apply weather and climate information to problems facing agriculture and commerce. Students acquire the skills and tools necessary to improve the health, safety, and productivity of today's world. Graduates work on many environmental problems such as air quality, renewable energy sources, climate change and the impacts of climate change. The option involves extensive coursework in meteorology, physics, and mathematics, as well as first-hand experience in applying basic concepts to real world situations. Internship programs are available with private industry, the National Weather Service, or the National Oceanic and Atmospheric Administration. In addition there are regular opportunities to work in University laboratories and the State Climate Office. I love that my major is in a small department in this big university. You have all the advantages of the Purdue community and a small, personalized program. I wanted to go to school away from home. Even so, coming from a big city on the East Coast to a small city in the Midwest was an adjustment. I like the independence of being on my own, but I still have a strong support system in my major. My academic advisors are always willing to help. Whatever you need, someone will point you in the right direction. The university as a whole is like that, too. You just have to take the initiative. Ag classes expose me to a lot of different subjects to help me narrow down what I want to do. The College of Agriculture also sponsors events to bring students together—everything from ice cream socials to internationally known speakers. I thought most of my classmates would be from rural areas, but, like me, a lot of them are from cities. There are so many majors in the college that you meet people from all different backgrounds. I love that Purdue encourages study abroad so much. I want to study in either Europe or Australia. The people in the International Programs in Agriculture office are doing everything they can to arrange it for me. I’m interested in research, particularly the relationship between climate and agriculture. I work at the Indiana State Climatology Office and collect and distribute data. I have also been able to get started in research. I’m doing a project on evapotranspiration in Indiana. Research brings everything down to earth by teaching me how to apply science. Working with graduate students there helps me discover what I can do with my degree. Agronomy-sponsored seminars bring in professionals from all the major seed companies and other related industries. Even if it’s not my path, it’s interesting to find out what alumni do with their majors. Purdue is a Big Ten school, so there’s something happening every night. I attend as many athletic events as I can—I like all the sports. I met many of my friends through campus activities. My freshman year I ran club cross country. I’m even in a tap-dancing club. I’ve never tap danced before but a friend runs the club. It’s turned out to be a lot of fun. For my major, I’m in the Purdue University Meteorological Association, Agronomy Club, and Forecasting Club. Purdue has so many organizations to check out; it’s another advantage of going to a big school. Many graduates pursue careers with the National Weather Service, the National Environmental Satellite Data and Information Service, the Environmental Research Laboratories, and the Department of Defense. Graduates also pursue careers with private meteorological or environmental consulting firms that provide weather information and apply atmospheric sciences to air pollution control, energy distribution, marketing, transportation, weather modification, and agriculture. Graduates also work for insurance and commodities industries that employ meteorologists who are educated in statistics, agriculture, and world climates.